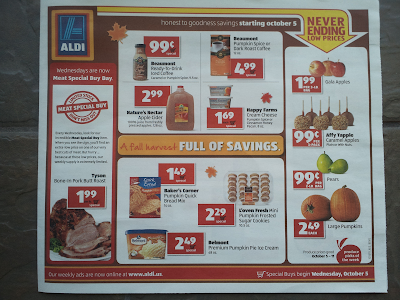 Kelly the Culinarian: Get Thee (and me) to an Aldi! I could, and might, buy everything on this front page. There's pumpkin coffee and prepared pumpkin lattes. And pumpkin ice cream! I should have thought of this first. I see apple cider, cheap pumpkins and apples and pears on sale. What to do with these sale items?